Some are laughing, others are crying! It caused me to post this text that I wrote in December with two objectives: to keep track of what were perhaps the worst Christmases that Venezuelans lived and to realize how hyper inflation continues to hit our pockets leaving a huge difference between the prices that were handled only four months ago and the ones we face now. In the middle of the most serious economic crisis in its history, Venezuelans resist and seek to keep their traditions alive. Christmas is a time to share, therefore, in every part of the world it is customary to make a family dinner, which in most cases, reflects the characteristics of the history and cuisine of each country. The main course of the Christmas dinner, in Venezuela, is composed of the traditional hallaca, ham bread, pork leg and chicken salad accompanied, sometimes, by black cake, walnuts, hazelnuts, nougat or milky sweet. Undoubtedly, the protagonist of the Venezuelan Christmas is the hallaca. This delicacy of indigenous origin consists of a bun of corn dough stuffed with a stew of chicken, pork, beef or the three together wrapped in banana leaves attached with wick. The exchange of hallacas between different families is part of this interesting Venezuelan tradition, transforming itself into a gesture of friendship, cordiality and kindness, both for those who share their hallacas, and for those who willingly accept to try a hallaca of people related by friendship or the ties of kinship. "I have walked the Car market, the Guaicaipuro market and now Quinta Crespo and I have not managed to get the meat for the hallaquitas", protests Carmen Rodríguez, 80 years old as she makes her way through the twists and turns of the Quinta Crespo market accompanied by her granddaughter . After the regulation of chicken and beef, essential ingredients for the production of the hallaca, buying these products has become an odyssey. "The meat can get it but with surcharge, in this country the merchants want to take advantage of everything, even in difficult times" denounces Magaly Álvarez who confesses to be in charge of preserving the tradition in her family. Álvarez aspires to cook 150 hallacas, "not a third of what he did in past years, we are many, at home we armed up to 500 hallacas, we needed a day and a half to complete the task," he added. In the main markets of the capital, prices fluctuate as much as the parallel dollar does, that is, they can vary even in a matter of hours. 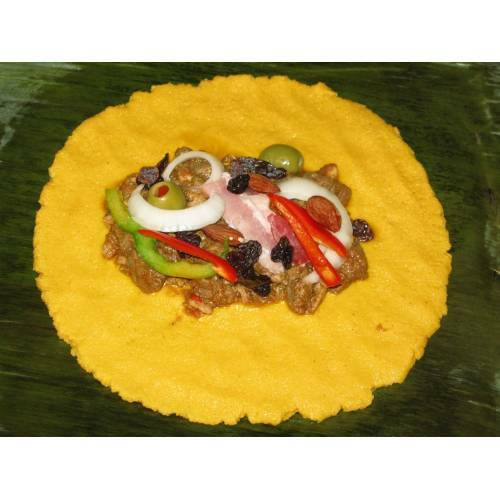 For the first days of the month of December it was required to have 2,000,000 Bs to make 20 hallacas. "Without hallacas there is no Christmas," announces an old woman who wanders through the market of Quinta Crespo carrying two bags practically empty. Alberto De Abreu has been serving his butcher shop in the market of Guaicaipuro for 30 years and admits that it is the first time that sales have declined so much in December, "is that even traditional customers are not buying, this promises to be a sad Christmas." On the first of November, the President of the Republic, Nicolás Maduro Moros, announced a new salary increase and the approval of a Bonus of 500,000 Bs on the occasion of the declaration of the beginning of Christmas. The Christmas Bonus would benefit 400,000 families and would be granted through the Carnet de la Patria, a month after the announcement some people claim to have been beneficiaries of the presidential initiative. "I am very happy with that gift that our president gave us", affirms smiling Zaida Ramos, an inhabitant of the Antímano Parish who, when asked about how she used the money deposited in her Banco de Venezuela account, indicates that the emotion has not stopped thinking in that. For her part, Maribel Ramírez has not benefited from the Christmas Bonus, as she refuses to have to take out the Carnet de la Patria so that she can be granted the benefits that correspond to her just because she is Venezuelan. She also comments that 500,000 Bs are insufficient for anything you want to buy clothes or food, "the millions of my ID come up short to make the hallacas." The most joyful time of the year has ended up saddening the vast majority of the Venezuelan population in the face of the impossibility of covering the costs of the meals and rituals they traditionally performed. "I did not release for a long time, but I had done everything possible to dress my kids even if I was humbly," says Dora Ruiz at La Candelaria Parish, astonished by the high prices of the different garments. Sharon Mendoza, in charge of a shop in the area, says that the most economic item that the store has is a defective flannel and costs 280,000 Bs, since in normal conditions it would be between 340,000 and 370,000 Bs; the shoes range between 800,000 Bs and 4,200,000 Bs. Undoubtedly there will be few families that will be able to enjoy the traditions in this Christmas that seems to have been annihilated by the exacerbated inflation that has progressively diminished the purchasing power of the people. Five salary increases throughout the year and the granting of social benefits have not been enough to counteract the serious crisis that Venezuela is subjected to. It is common to hear manifestations of dissatisfaction in different areas of the city as to how the one that was once the most anticipated time of the year is developing. This has been a Christmas full of unfulfilled promises; there are many households that are still waiting for the arrival of the Christmas surprises that would be granted by the Local Supply and Production Committee (CLAP), which according to official spokespersons would include the sale of a pig or leg and a bag or box with the ingredients necessary for the realization of the Christmas plate, in addition to this the beneficiaries of the Christmas bonus would be raffled and gifts would be granted in the homes where the children lived. Within three weeks of the end of the year, most households are still awaiting the execution of these offers. Nobody escapes the consequences of the situation that crosses the country, children and pets have also been affected, the last because of the shortage and high cost of their food, the first for all the aforementioned and the uncertainty of whether this year The Baby Jesus or Santa Claus will be able to satisfy their expectations or at least be able to deliver something so that they do not remain empty-handed. The most sought after toys this year, or at least, the most asked for have a cost that goes from 1,000,000 Bs to 15,000,000, quite unattainable for most citizens, taking into account that the minimum wage was 230,000 Bs with the last adjustment decreed by the National Executive. A halo of sadness invades every corner of the country, at least 130 mothers mourn the absence of their children who were killed at the hands of repressive forces of the National Government, while others mourn the distance of their affections who crossed our borders in search of better opportunities , that unfortunately the country is not in a position to offer at this moment that it has been through.